George Beard and Harold Hutchins are seriously amazing kids. Not only did they create the one and only Captain Underpants, but they’ve saved the world FIVE TIMES! And now this dynamic duo bring you an all-new superhero! He’s faster than a speeding stroller, stronger than diaper rash, and able to leap tall buildings without making poopy stinkers. Yes – Super Diaper Baby is the first newborn ever to fight crime, stomp on evil baddies and not even get his diaper dirty. But can he save the planet from diabolical Deputy Doo-Doo – a giant, evil, radioactive lump of YOU-KNOW-WHAT? Very funny and creative. Lots of Flip – O – Ramas to go around. I would reccomend ages 7-13. 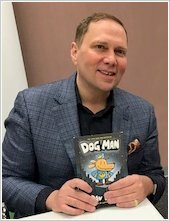 Another fab story by George Beard, Harold Hutchins and the fabulous Dav Pilkey. 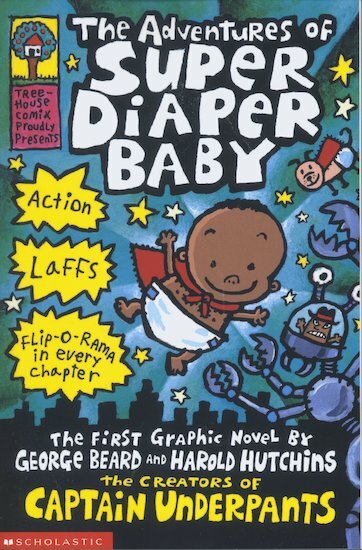 This book is about a newborn baby super-hero named Super diaper baby but the real name of this baby is Billy Hoskins. Find out more in this amazing book!!! Didn’t really like this book to be honest it deftly would only be 2 stars.